Frozen Food - Canton Food - Los Angeles - CA | Canton Food Co.
Over 50 different products to choose from at everyday low prices. 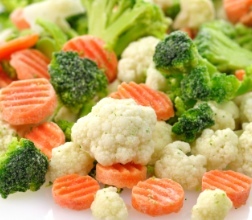 We supply a complete line of frozen vegetables such as Peas and Carrots, 5 Way Mixed Vegetable, Eggroll and Wonton skins, French Fries and much more. Canton Food services restaurants and distributors in the LA County area since 1969; we like to think that we must be doing something right. Come in and see for yourselves and experience the difference.